Controlling weeds can be challenging to landscape professionals or home gardeners since landscapes often include a mix of turfgrass, annual plants, herbaceous perennials, shrubs, and trees. Did you know that every 60 days, a new and potentially damaging invasive species enters California? California residents can help in the fight against invasive species by learning and participating next week (June 2-10) in the California Invasive Species Action Week. Snails and slugs can be destructive pests in gardens and landscapes when they devour entire seedlings or chew holes in leaves, flowers, fruit, and even the bark of plants. Manage these pests by getting rid of their hiding places, setting up traps, or planting resistant plants. For more information about effective ways to manage snails and slugs, read the newly revised Pest Notes: Snails and Slugs by Cheryl Wilen, Area IPM Advisor, San Diego, Orange, and Los Angeles counties; and Mary Louise Flint, Extension Entomologist Emerita, UC Davis and UC IPM. This Earth Day, Sunday April 22, help natural enemies by growing insectary plants. Natural enemies, also called beneficials or biological control agents, include lady beetles (ladybugs), lacewings, spiders, parasitic wasps, and even some mites! These natural enemies feed on pests in the garden and landscape and may reduce the need for insecticides. Protect natural enemies by avoiding the use of pesticides that kill them and keeping ants out of pest-infested plants. This time of year, you may notice a white, powdery looking growth on fruit, vegetable plants or ornamental plants in your garden. What is it? It could be powdery mildew. Powdery mildew is caused by several different fungi that may attack plant leaf surfaces, shoots, fruits, and flowers. There are several species of powdery mildew; all are spread by wind and thrive in shady areas when temperatures are between 60-80 °F. 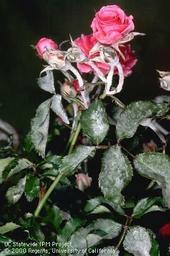 The fungi attack both new and old foliage, and can be a problem on certain plants. The disease usually occurs first on new leaves, before spreading to older parts of the plant. This is why over fertilizing worsens powdery mildew.